After the Battle of France in 1940, the J.Gast KG factory in Berlin were ordered to develop a launcher for the Wurfgerät 40 which could be fitted on top of the Sd.Kfz 251 armoured vehicle. The result was a simple tubular frame serving as a vehicle-carried launcher for these heavy rocket projectiles. Vehicle-carried Wurfgeräte 40 gained a nickname Stuka Zu Fuss due to their qualities similar to that of aerial bombing - high explosive power coupled with mobility of deployment. Because of the very limited accuracy of the weapon the system was mostly used for area targets. Sadly, many cities on the eastern front suffered from the destructive power of these missiles. There were more Stuka Zu Fuss vehicles than the Sd.Kfz 251 with which the term is usually associated - for example the ex-French Renault UE. 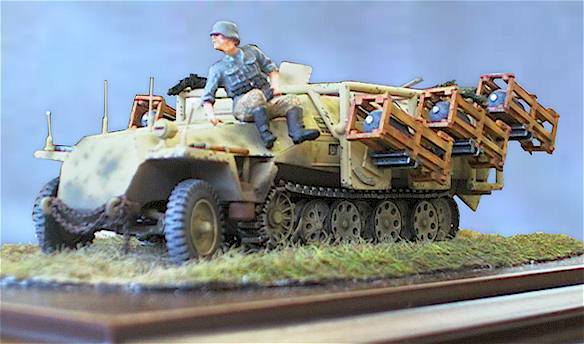 As for the Sd.Kfz 251, the steel frame with six wurfrahmen could be mounted with simple tools on top of all versions of the vehicle. It would appear that the most commonly used variant for the purpose was the 251/1, but there is evidence of other subtypes carrying the same weapon. The official name of the resulting vehicle was SdKfz 251/1 Mittlere Schützenpanzerwagen mit "Wurfrahmen 40". The launcher could be used for both the 28 cm high-explosive rocket using a wooden crate and a 32 cm napalm projectile using a metal crate. 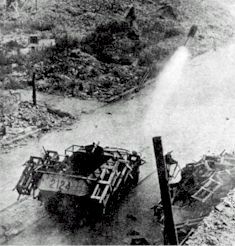 Aiming was done by turning the entire vehicle into desired direction. Launchers could then be be angled from 5 to 40 degrees. The maximum range was about 2000 meters. Because of the open body of the vehicle, the rockets could only be launched with the crew outside and at the safe distance. A control box connected with the launchers with cable was used for firing. Andreas Herbst built the 1/72nd scale model shown here. 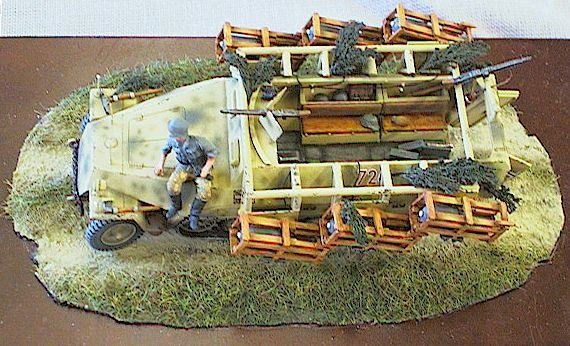 Andreas used the Hasegawa Sd.Kfz 251/1 kit as the basis. 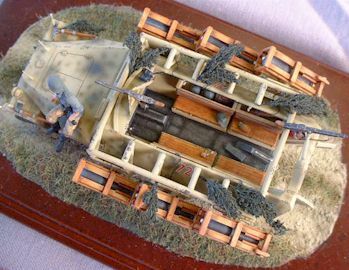 It is one of the better Hasegawa offerings in the scale, comprising of around 100 parts with trouble-free fit and clear instructions. The overall level of detail included in the kit is very good, featuring for example the complete crew compartment with detailed dash board, radio, gear shift levers, steering wheel and driver's seat. Also the wheels are crisply moulded with nice detail. About the only shortcoming of the kit are the tracks, which are made in soft vinyl. They lack detail on the inside and are too thick for the scale. 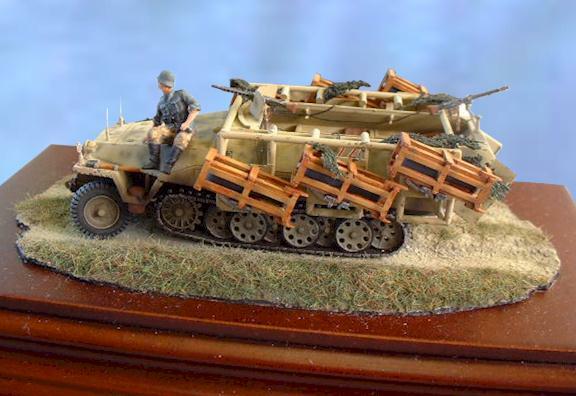 A decision was made early during the project to replace these with plastic-moulded tracks from the Escii Sd.Kfz 251. The basic assembly of the vehicle proceeded as per instructions. Then the Wurfrahmen "borrowed" from the Escii kit was attached on top of the body. Details like ammunition boxes, cables, forward machine gun shield and a few more detail parts have been scratchbuilt. 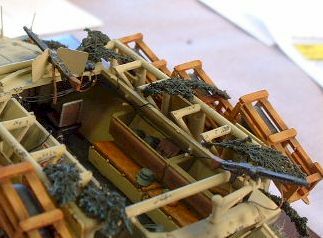 Hasegawa moulded the rear fighting compartment doors in one piece, so they too were replaced by the separate Escii items fixed in the open position. Andreas used crew figure from Revell with Milicast replacement resin head. The model has been airburshed using Humbrol enamels and Tamiya acrylics. Detail painting, shading and weathering had been done with aritists oils and pastel chalks. Scratch-built pieces of foliage completed the camouflage. The finished model was set on a solid wooden base with irregular patch of scale country road providing the scenic setting. The model won the Best-in-Show award at the latest Swedish national modelling competition in Stockholm. "I was very flattered" says Andreas Herbst. "I didn't expect such a small and relatively unappealing object to win such a prestigious award". The contest jury commented their choice in the following way: "Getting so much lifelike appearance in this small scale is utterly difficult. Through wonderfully subtle finish and well-balanced overall detail, this model has the resolution and depth which set it apart from the crowd." Andreas explains: "The main difference between this project and many other small-scale armour models can be summarized with one word: time. This model took almost four months of work to complete. The materials I used were entirely ordinary: plastic sheet, scrap photoecthed bits, fine copper wire etc. It is difficult to tell how I did particular details - but everything just took time."